Hello friends! My name is Nick and I am Rene’s new site assistant. I wanted to share some helpful CCIE Lab tips that I learned over the past months. I have been following this rules as I continue my pursuit for CCIE R&S and they have help me hone my skills significantly. 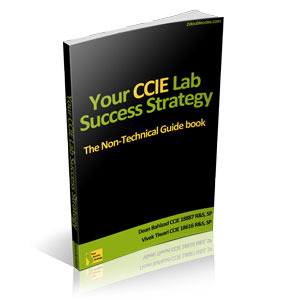 Read “Your CCIE Lab Success Strategy” by Dean Bahizad and Vivek Thwari. This book contains no technical information but tells you pretty much everything else. 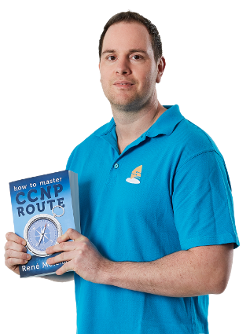 It is a very realistic, motivation read about two adult men with full-time jobs and families who were fully committed to their own (and eachothers) CCIE journeys. Cost is about 30 USD. I highly recommend this book. I will summarize a few points from this book in the article as well. Before doing any lab, read the whole lab first. Understand the big picture and come up with a strategy. 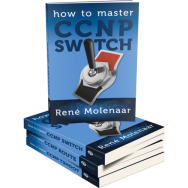 For example, if you are forced to use OSPF with a point-to-multipoint frame relay interface with no broadcast DLCIs … you should be thinking about which OSPF network types will work in this situation, even though OSPF configuration isn’t until later. If you find out that all EIGRP neighborships must have authenticated routing updates, you should configure this initially to avoid having to backtrack. Buy a small binder, graph paper, and a pack of colored pencils. This is your CCIE Study Binder and should remain on your person at all times during study sessions. Before beginning your lab (and after reading it, of course), draw a few pictures of your network so you know what’s happening. Use different colors for different protocols or technologies. Sometimes it helps to have multiple diagrams for each technology to avoid clutter. For example, one diagram can label all interfaces, IP addresses, and subnet masks. Another can detail IGPs, FHRPs, and points of redistribution. Another can detail BGP and the specific peerings that are permitted. Another for LAN switching, another for frame relay, etc. Build a common alias list and always use this for studying. This is especially helpful with common show commands that wear on your hands … and your time limit. As an example, here is my alias list. The cool thing about aliases is that you can use them in configuration mode, and you can also append to the base commands. Don’t be afraid to use the basic commands. I’m guilty of it too; sometimes we forget about our best friends like “traceroute” and “show arp” when we are troubleshooting connectivity issues. The next-hop column of the BGP table isn’t always the real next hop, and sometimes only “traceroute” will reveal this. In the aforementioned book, Dean mentioned taking breaks to do pushups or other physical activity just to clear his mind and keep his body from becoming stiff. Remember that you are a human, and you were not mechanically designed to sit for hours without moving. I recommend spending 1 minute out of every 30 standing up and moving around at a minimum. Do pushups or jumping jacks if you like. After weeks of ignoring these needs your body will begin to ache and it will break your concentration on the lab. Don’t neglect your diet either. You will have to sacrifice some personal things, such as social events, family time, and even exercise. Your body still requires energy and care, even as you fine-tune your mental skills while focusing on CCIE. When you make your own labs, make them difficult on purpose. Connect devices in weird ways, configure nonsensical BGP peerings, and impose restrictions on yourself. I promise that you will build labs that seem impossible for even you to solve. One of the best ways to do this is to draw devices on a piece of paper, connect them, then draw it again in a neater fashion to see what the resulting network looks like. Minimize the use of “show running-config”. This will force you to use other show and debug commands to increase your mastery of a technology. If you must use show run, do so with a pipe and be conservative with it’s use. Anyone who has ever worked on a real-life, production router knows that space-barring through show run is a technique not appropriate for a CCIE candidate. Only a small percentage of CCIEs pass on their first attempt. Trying again and again and again after failure is what sets CCIEs apart from the “well I tried to be a CCIE but quit” crowd. I know two CCIEs in person and both required multiple lab attempts. You should not expect to fail, but you should plan for it in terms of money, vacation time from work, and everything else that goes with studying and taking the lab exam. Im pursuing the CCIE RS too. Have 2nd bootcamp coming up in January. Im doing full labs through the cisco360 learning network, these labs are hopefully somewhat identical to the real lab exam. When I look at these labs, I 100% agree with you on strategy and minimizing use of the sh run command. When you are working a lot with c6500 you learn never to do the sh run command without a pipe. Besides using aliases I love to use tcl scripts. ex. to test connectivity with a ping script. I always read the whole lab, then spend 5 minutes on the ip and ipv6 diagram. From these diagrams I build the tcl ping script with all the ip addresses and segments them in the different routing protocols. I read that book a few months back, and recommended it to all my colleagues. A great read! Can i have topology (.NET) file for CCIE lab, It will save lot of my Time. Excelent, this comes in at the right time. 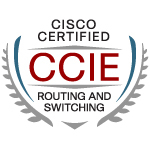 I’m looking forward to my own CCIE track. Thank you for setting time aside to help out the rest of us to reach our own certs. There’s FUN ahead!